Ireland has disclosed a “horrendous” worst caseprice tag of over €50bn ($68bn) for bailing out its distressed banks and said it would have to make more drastic budget savings. The euro dipped briefly against the dollar as markets contemplated Dublin’s ever growing fiscal hole, but the 16-nation European currency soon recovered and investors reacted calmly overall, having largely priced in the latest bad news. Elsewhere in the eurozone, Spain lost its final triple-A credit rating as Moody’s cut it by one notch to Aa1, citing the budget impact of slower economic growth. The downgrade had been widely anticipated after similar moves by Standard and Poor’s and Fitch. Moody’s said the outlook for Spain, which was to present a tough 2011 budget with a much reduced borrowing requirement, was now stable. Portugal – the other eurozone nation in the markets’ cross hairs – announced new spending cuts and tax rises for next year, designed to reassure bond markets that have driven its borrowing costs to near record levels. In a stark indicator of a two-speed economic recovery in the euro area, German unemployment fell to its lowest level in more than 18 years in September. The jobless rate was 7.5 percent compared to 20 percent in Spain. Ireland’s central bank estimated the “stress case” cost of winding down Anglo Irish Bank at €34bn. Prime Minister Brian Cowen’s fragile government said it would have to inject another €2.7bn into Irish Nationwide building society, on top of €2.7bn already earmarked. Finance Minister Brian Lenihan said the state would probably raise its stake to a majority in Allied Irish Banks, which needs an extra €3bn in capital this year. Dublin-based Davy Stockbrokers said the gross cost of restructuring the banks under a base scenario was now €46bn, which would rise by €5bn under the “stress case” for Anglo. The “Celtic Tiger” that was once the EU’s fastest-growing economy will be shackled by a public debt burden of nearly 99 percent of GDP, which analyst Donal O’Mahony of Davy Capital Markets said would peak at 105 percent in 2012. 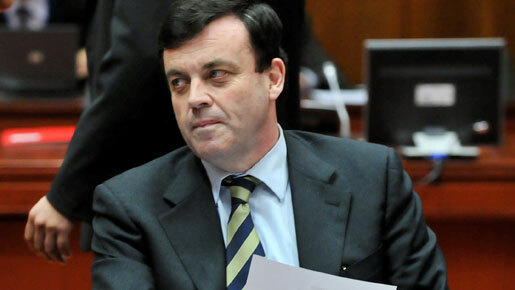 Lenihan said the level of state support for the banking system remained “manageable”, even though it will push the 2010 deficit up to an unprecedented 32 percent of GDP – more than 10 times the EU’s ceiling. He said Dublin remained committed to reducing the deficit below the EU limit of three percent of GDP by 2014 and would outline a four-year budget plan in early November as sought by Brussels. Traders cited the fact that Moody’s does not now expect to cut Spain’s debt rating further and said a bill of up to €35bn for Anglo Irish had been priced in.